It was a special day for les Canadiennes of the CWHL as they celebrated an unprecedented level of success in professional women’s hockey. In a league where no team besides Montreal has more than two titles, les Canadiennes unveiled four championship banners before their game against the Toronto Furies. The reigning Clarkson Cup champions defeated the Calgary inferno last season in the finals having also won the league title in 2009, 2011, and 2012. The team certainly made sure the unveiling was a ceremony to remember. Plenty of Canadiennes alumna were in attendance as the banners unfurled and the crowd made sure they knew just how proud they were to have their former players present. The home team seemed to certainly take energy from this ceremony, looking hungry and dominant in the early goings. 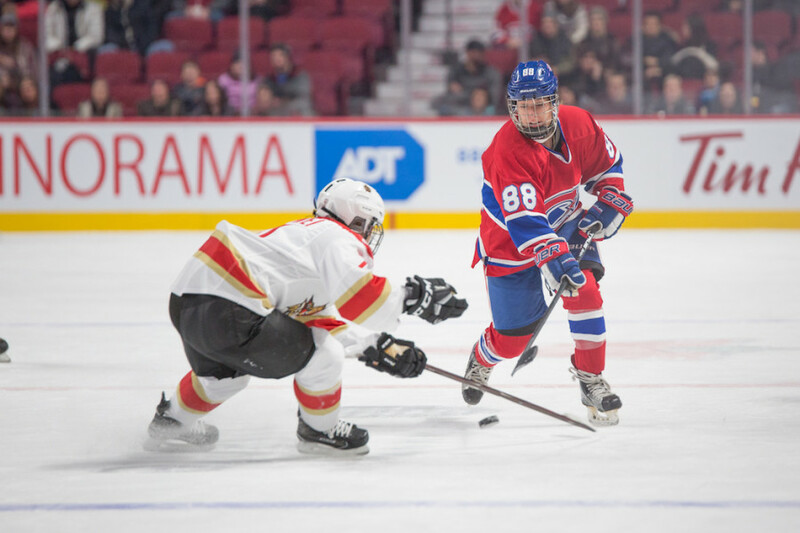 Despite a 2-2 game entering into the third period, les Canadiennes had clearly outmatched the Furies who they had beaten in their last two games by a combined score of 15-4. Early on, Montreal seemed to be controlling the game, but missing chances by inches as Toronto goaltender Amanda Makela stood strong. The Furies took the lead on a partial breakaway thanks to a bad line change. 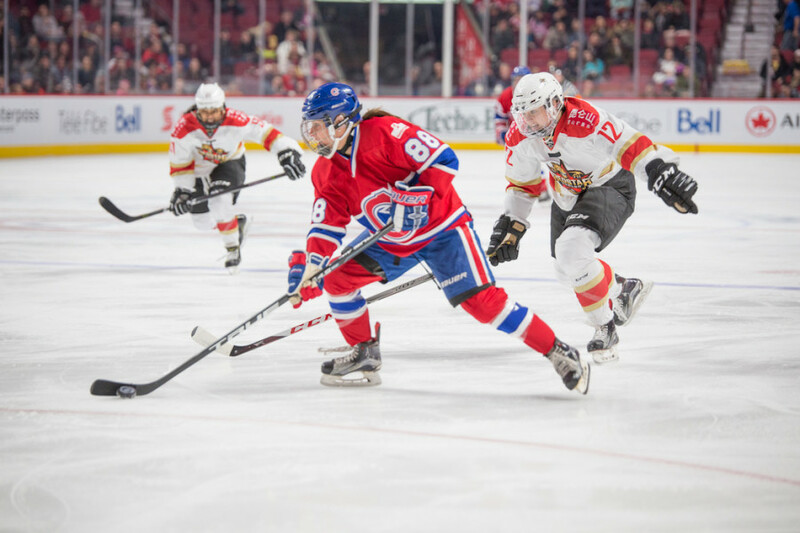 Undeterred, the Canadiennes stormed back scoring two goals 23 seconds apart thanks to forwards Noémie Marin and Jordanna Peroff. The second period saw Toronto tie the game but again, Les Canadiennes were outplaying them. Both of Toronto’s goals came off of Montreal hurting themselves rather than Toronto managing to break through their defense. The second frame ended with Montreal killing off a long 5-on-3 penalty to keep the game even going into the third. “We knew they were going to come out hard. Going into the third it was 2-2, It could have bounced on either side,” said Marin, the game’s first star. It didn’t take long to learn that it would end up bouncing Montreal’s way. They found themselves on the powerplay 22 seconds into the third and it wouldn’t be long until they found themselves up by a goal courtesy of forward Marion Allemoz. 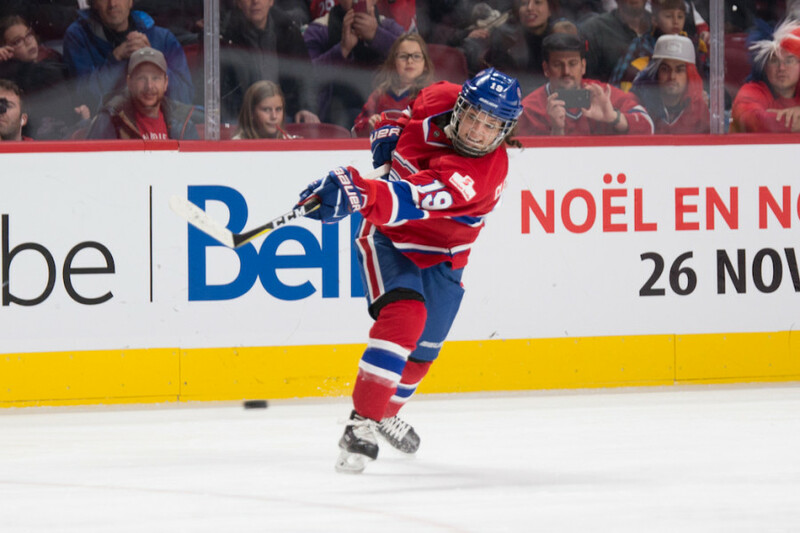 The momentum swung to Les Canadiennes, where it would remain for the rest of the game. After going up a goal, the team added another four to safely pull away from their opponents. Marin’s hat trick helped her the second leading scorer in CWHL history, sitting only below Ouellette. Late in the game, Ann-Sophie Bettez and Marin each seemed determined that other be the one to score, passing it back and forth before Marin eventually buried it. Marin remarked that that was a perfect way to cap off her three-goal effort. “I love playing with everybody on my team. The girls aren’t selfish. We want to have fun, we want to win,” said Marin. On a day that celebrated so much success by the team, despite personal success, Marin was quick to bring up what earned the team those championships. The win gives the team their 18th point, putting them in a three-way tie for first place with the Calgary Inferno and Kunlun Red Star. They’ll next take the ice against the Markham Thunder on Dec. 16.